Foodservice Gateway » Foodservice Rewards offers access to fantastic products … and even greater flexibility! 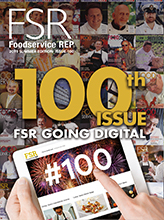 Foodservice Rewards offers access to fantastic products … and even greater flexibility! All around Australia the smart foodservice professionals are signing up with the industry’s pre-eminent rewards program which offers real benefits for their businesses. A huge hit in the US and Canada, Foodservice Rewards has been growing in popularity here with a steady stream of signups from chefs, restaurateurs, F&B managers, catering operators, and professionals working with the pub/club/bistro and health/aged care market. All of them have recognised the benefits of belonging to a program which offers points for every participating food product purchased and which never expire but remain valid until redeemed. And the big range of popular Foodservice products bearing rewards labels means points can accumulate surprisingly fast! Proof in point, members have already entered codes from more than seven million labels through the Foodservice Rewards program. “Participating in the program is simple and once members see the benefits to their business, looking out for the bright yellow Foodservice Reward labels on their food order can get addictive,” says Foodservice Rewards Business Development Director Andrew Bull. Look out for the yellow Foodservice Reward labels from participating brands including Nestle, Maggi, Buitoni, Patisserie D’Artiste, Krio Krush, Gourmet Garden, Huon and Pilot. The fantastic range of around 4000 premium quality brand merchandise items for which accrued points can be redeemed offers another strong incentive to join. These include restaurant-quality professional foodservice equipment such as utensils, bakeware and culinary items; big-ticket items like big screen TVs which can be used on your business premises or as a promotional prize or giveaway item; personal electronic devices including iPods, great as staff products for ‘employee of the month’ or similar incentivization programs; and child-friendly products ideal for customer giveaways. “With Foodservice Rewards, you can redeem points for merchandise for personal use, as capital equipment for your business, to reward staff or use in consumer promotions or fund-raising – even donate them to local charities if you wish,” points out Andrew Bull. “Foodservice Rewards also offers flexibility for larger workplaces by giving the option to participate with either a single account per foodservice business, or via a group account which allows you to nominate staff members who can access the program and redeem points as required. You can register and access your Foodservice Rewards account to redeem points via the Foodservice Rewards website, and as mobile technology marches on the program has recently launched a new mobile app for smartphone use, available for both the iPhone and Android platforms. “The new mobile app can be used to directly enter your reward codes into your phone, so you no longer have to be at your computer or laptop to redeem points,” Andrew explains. “That’s proven to be very popular. All of which means Foodservice Rewards is easier than ever to access and use – giving foodservice professionals across Australia even greater flexibility in their ability to participate in the industry’s best rewards program which offers fantastic business benefits! For full details on how the program works, to register online or to download the latest smartphone apps visit www.foodservicerewards.com.au.